The 6 Step only comes in a XL Step. This model does come with the hinged leg. When you fold this model flat it will be 12 ft. in length, but with the leg hinged it is only 97″. Wheels are an option for this model. All our platforms are built to last. This model has a 2,000 lbs capacity strength. 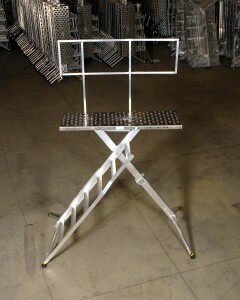 We build our platforms with only solid welds. This means that years from now your platform be just as strong as the day you bought it. 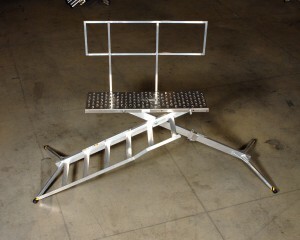 Also the platform is made of aluminum so it will not rust. Your platform will be your new favorite tool for years to come. 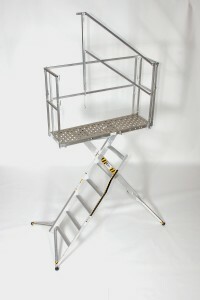 SafeTec highly recommends upgrading the single sided handrail for one of our wrap around handrails for this model. Please call us or email us for availability. We sell direct and through distributors. Buy online today. 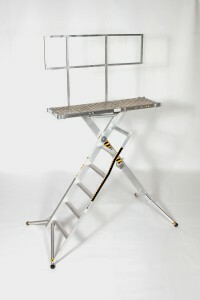 Choose a FREE GIFT of either the Rung Safety Bar or a Work Tray! Tell us which one you want for free in the special requests box at checkout.